The Hebrew word mitzvah literally means commandment, but it has also come to mean a good deed. Hiddur means to make beautiful. Hiddur mitzvah, then, is a commandments to make things beautiful while doing good. We think that all Jewish ritual pieces required in mitzvot should be as aesthetically pleasing as possible in order to glorify G-d and his commandments. The Hiddur Mitzvah Project is the creation of Gary Rosenthal. In the spirit of hiddur mitzvah, he has been creating a unique line of sculpture called The Gary Rosenthal Collection for over 30 years. His beautiful, functional works of art are made of mixed metal and brilliant fused glass, and have a contemporary style that is inspired by tradition. The Hiddur Mitzvah Project makes it possible for anyone to create their own Judaica in the style of Gary Rosenthal. The complex process of creating fused glass is simplified so that anyone at all can make their own. 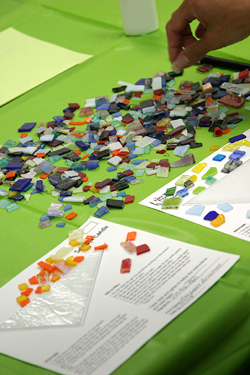 Using white craft glue, participants create mosaics of tumbled glass pieces on precut glass templates. Those mosaics are sent back to the Gary Rosenthal Collection studio where they are fired and become part of a finished piece of Judaica. We've even developed the Preschool Paper Program for children too young to handle small pieces of glass. Children in Jewish families are traditionally taught Jewish laws and rituals, but values like art and creativity in Jewish life are sometimes overlooked. Our mission is to ensure appreciation and a sense of artistic responsibility in children and communities alike. While we believe the act of creating beautiful Judaica is a mitzvah in itself, the project can be used as a mitzvah in a variety of other ways. For example, items created with our Twinning Project can be donated to those in need or the project can be used as a fundraiser. To see some examples of the many ways the program has been used for mitzvot take a look at these past projects. The Gary Rosenthal Collection is committed to performing and helping others perform hiddur mitzvot through The Hiddur Mitzvah Project--a fun way to perform a service and at the same time teach invaluable lessons about arts enrichment and community service. "The pieces are absolutlely gorgeous and will be a lasting memento of the class and the experience of learning together. To have the opportunity to create such personalized treasures is priceless." ©2016 The Gary Rosenthal Collection, Inc.